Hello there Wottareaders!, are you ready for some horror? then get prepared because Pet Sematary is almost here! After a successful adaptation of some of the best Stephen King books like IT and Gerald’s Game, as well as the popularity trailing Hulu’s Castle Rock series believed to have been inspired by Stephen King, the prolific author is in the news again. 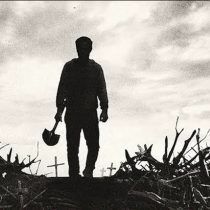 This time, it is about the second time adaptation of his popular novel, the Pet Sematary. What is Pet Sematary about? Pet Sematary has a relatively simple storyline which focuses on the Creed family, Dr. Louis Creed upon relocation from Boston to Maine with his wife Rachel and their two tender kids discovers a mysterious pet kirkyard concealed in the woods near the family’s new home. This cemetery has the unpleasant and unnerving capability of bringing the dead back to life. When tragedy strikes, Dr. Louis turn to his unusual neighbor, Jud Crandall, this triggered off a dangerous chain reaction that gives free rein to loads of evil with horrendous consequences. In 1989, six years after Stephen published Pet Sematary, the novel recorded its first movie adaptation by Mary Lambert. Little did anyone knows that the book will record yet another adaptation thirty-six years later. Gifted and delighted Stephen King is proud of his achievements as he took to his twitter handle to praise his literati skills and his recent success; the adaptation of Pet Sematary. Below are all that you need to know about one of Stephen King movie. Just like all other Stephen King movies, the directors of Pet Sematary are among the finest in the horror genre. The duo, Kevin Kölsch and Dennis Widmyer directed Starry eyes, a feature-length horror movie, and MTV’s episodic Scream. They also have a handful of shorts episodic collections to their credit, before stirring the Sematary’s radar. The 2019 Pet Sematary adaptation have actors from the “Milky Way”. The skin of the hero, Louis Creed will be worn by the popular Jason Clarke of the Dawn of the Planet of the Apes. While Amy Seimetz stars as Rachel Creed, his wife. The character, Jud Crandall is also in the person of John Lithgow of Dexter and The Crown. Other notable casts include Hugo Lavoie, Obssa Ahmed, Jeté Laurence, Sonia Maria Chirilia and Lucas Lavoie. The 1989 adaptation wasn’t muscular enough to pull out these calibers of casts. Pet Sematary is making its debut by April 5, 2019. Similarly, Jordan Peele’s follow up to Get Out, an original horror-thriller called Us, starring Academy Award winner Lupita Nyong’o, Winston Duke, and Elisabeth Moss is due in March. Other movies that will hit the theaters this year include the Happy Death Day 2U (February), New Mutants (August) and Vincenzo Natali’s adaptation of In the Tall Grass. These will make 2019 a great year for mainstream horror. Critiques called it “…another hacked-up, sloppy screenplay from King,” this points out that there are mild differences between the book and the adaptation. For example, Wendigo is the depiction of a powerful demon with necromantic abilities; the Wendigo cursed a cemetery in Maine during the Colonial Era known initially as the Micmac burial ground. For some yet unexplained reasons, during Mary Lambert’s adaptation of Stephen King’s novel, she failed to show Wendigo (despite the fact that earlier drafts of her script featured this character). However, it is yet to be ascertained whether or not it Wedingo will make an appearance in the 2019 adaptation. Considering the positive response to the character Pennywise in last years’ IT had it would be a great addition to this movie. A demonic character who haunts and manipulates a small town might be a perfect fit for this version of the movie, and fans of the novel will no doubt appreciate it staying truer to the source material than Lambert’s adaptation did. Hope you are awaiting this movie! if you like Stephen King, maybe you would like to read a free short story written by him? See here.